Your Body, Your Yoga goes beyond any prior yoga anatomy book available. It looks not only at the body's unique anatomical structures and what this means to everyone's individual range of motion, but also examines the physiological sources of restrictions to movement. Two volumes are provided in this book: Volume 1 raises a new mantra to be used in every yoga posture: What Stops Me? The answers presented run through a spectrum, beginning with a variety of tensile resistance to three kinds of compressive resistance. Examined is the nature of muscles, fascia, tendons, ligaments, joint capsules, bones and our extracellular matrix and their contribution to mobility. The shape of these structures also defines our individual, ultimate range of movement, which means that not every body can do every yoga posture. The reader will discover where his or her limits lie, which dictates which alignment cues will work best, and which ones should be abandoned. Volume 2 will take these principles and apply them to the lower body, examining the hip joint, the knee, ankle and foot, and will present how your unique variations in these joints will show up in your yoga practice. "More important than knowing what kind of pose the student is doing is knowing what kind of student is doing the pose." There is a revolution occurring in yoga today around the alignment paradigm. The concept of one and only one ideal alignment for each yoga posture, taught through an aesthetic focus on how the student looks in the pose, is being replaced by a functional approach that acknowledges not only the intention of the posture but each student's unique biology and biography. In parallel, the paradigm of focusing on the muscles as the limiters and causal agents of movement is being replaced by a broader understanding. The role of fascia is being recognized and incorporated into yoga classes and trainings. Beyond muscles and fascia, there is a wide spectrum of causes for and resistance to motion, ranging from various sources of tension to the qualities of compression. Your Body, Your Yoga is the first book in a series describing the many contributors to limitations in our yoga practice. This book looks at the lower body, and the variety of shapes, movements and potential restrictions to movement in the hips, knees, ankles and feet. Introduced are the causes of resistance to movement, the frequency, extent and consequences of human variation, and their implications for our yoga practice. While short, tight muscles can restrict movement, there are many reasons for a lack of mobility. The causes can be cast into a gradient, called the "What Stops Me? Spectrum" fascia, ligaments and joint capsules can be tight and tense, while compression arising from the body contacting other parts of the body will also impede movement. How these tissues develop their tension may be due to actions of our nervous or immune systems, or it may be due to our inherently unique body structure. Compression is the ultimate limiter of movement and is variable, depending upon a student's individual skeletal structure. All students are unique to varying degrees, and this individuality determines their ability and progress in their yoga practice and its benefit for them. "More important than knowing what kind of pose the student is doing is knowing what kind of student is doing the pose." There is a revolution occurring in yoga today around the alignment paradigm. The concept of one and only one ideal alignment for each yoga posture, taught through an aesthetic focus on how the student looks in the pose, is being replaced by a functional approach that acknowledges not only the intention of the posture but each student s unique biology and biography. In parallel, the paradigm of focusing on the muscles as the limiters and causal agents of movement is being replaced by a broader understanding. The role of fascia is being recognized and incorporated into yoga classes and trainings. Beyond muscles and fascia, there is a wide spectrum of causes for and resistance to motion, ranging from various sources of tension to the qualities of compression. Your Body, Your Yoga is the first book in a series describing the many contributors to limitations in our yoga practice. This book looks at the lower body, and the variety of shapes, movements and potential restrictions to movement in the hips, knees, ankles and feet. Introduced are the causes of resistance to movement, the frequency, extent and consequences of human variation, and their implications for our yoga practice. While short, tight muscles can restrict movement, there are many reasons for a lack of mobility. The causes can be cast into a gradient, called the What Stops Me? Spectrum: fascia, ligaments and joint capsules can be tight and tense, while compression arising from the body contacting other parts of the body will also impede movement. How these tissues develop their tension may be due to actions of our nervous or immune systems, or it may be due to our inherently unique body structure. Compression is the ultimate limiter of movement and is variable, depending upon a student s individual skeletal structure. All students are unique to varying degrees, and this individuality determines their ability and progress in their yoga practice and its benefit for them. Compulsory reading for those teaching and studying yoga! The best therapeutic exercise has a defined technique and dosage, but these are different for every person. 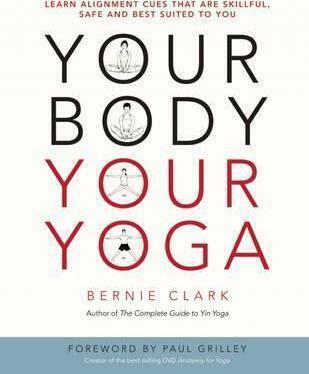 Bernie Clark masterfully guides readers through an understanding of their unique bodies. Nothing else compares to the value and knowledge gained. With this, readers can create the most rigorous, evidence-based and effective yoga practice, finding what works best for them.&#151; Professor Stuart McGill, PhD, University of Waterloo; Canada. You will not need another book on the mechanics of yoga. Bernie has written many wonderful books on yoga, but the one in your hands is his opus. I will be recommending this one to everyone!&#151; Sarah Powers, co-founder of Insight Yoga Institute and author of Insight Yoga; U.S.A. Finally, a book that dares to combine yoga with state-of-the art critical thinking and scientific reflection! To my knowledge, the most accurate and anatomically-knowledgeable book in this field. I knew that Bernie Clark would contribute something remarkable. But this book goes way beyond even the highest expectations. A truly groundbreaking contribution to the field of science-inspired yoga.&#151; Professor Robert Schleip, PhD, Ulm University; Germany. Your Body, Your Yoga is a fascinating, provocative, and scientifically-informed look at the inner workings of the body as it affects the practice of asana. Bernie Clark challenges much dogma in the modern postural yoga world, including a few heretofore sacrosanct principles of alignment, to demonstrate that a healthy and effective yoga practice should be adapted to each individual's unique needs, abilities and anatomy. Required reading for yoga teachers and yoga therapists, and highly recommended for avid practitioners. &#151; Timothy McCall, MD, author of Yoga As Medicine; U.S.A.
An exceptionally well-informed and interesting way of approaching the human enterprise of doing yoga. Full of beautiful and stimulating pictures and analogies, awakening a deep thirst to know more and think more yet.&#151; Loren M. Fishman, MD, B. Phil.(oxon. ), author of Healing Yoga and many other books; U.S.A. If you want to buy only one book on yoga and anatomy, buy this one. It fills a gap that urgently needed filling, and makes our work as yoga teachers and educators immensely easier. This will be a textbook for our future yoga teacher trainings.&#151; Anat Geiger, co-owner of YogaGarden; Netherlands. Your Body, Your Yoga is an essential book for all serious yoga practitioners. Through skillful marshaling of evidence, Bernie Clark decisively illustrates the importance of individuality in yoga practice.&#151; Norman Blair, Yoga teacher, author and trainer; United Kingdom. A must-read for yoga teachers and practitioners. This book will reframe the way you think about body movements. &#151; Jo Phee, senior yoga teacher trainer; Singapore. I am so amazed: Your Body, Your Yoga is more than a great book &#151;it is like participating in a training at home. I could not stop myself from finishing it.&#151; Devrim Akkaya, senior yoga teacher trainer; Turkey. This is an instant classic. Your Body, Your Yoga demystifies and reveals the limitations in one's yoga practice in a very clear and in-depth manner.&#151; Sebastian & Murielle, senior yoga teacher trainers; Indonesia. Bernie Clark author of the best selling The Complete Guide to Yin Yoga, has had a passion for science, health, sports and spirituality since childhood. He has a degree in science from the University of Waterloo and spent over 25 years as a senior executive in the high-tech/space industry. Bernie has been investigating the path of meditation for over three decades and began teaching yoga and meditation in 1998. He conducts yoga teacher trainings several times a year and aims to build bridges between the experiences of yoga and the understandings of modern science. He is creator of the YinYoga.com website. Bernie lives and teaches in Vancouver, Canada. Paul Grilley, creator of the influential DVD Anatomy for Yoga, began practicing yoga in 1979 after reading "The Autobiography of a Yogi" by Paramahansa Yogananada. He moved to Los Angeles in 1982 where he studied and taught yoga for 12 years. His special interest is the teaching of anatomy. He is the initial popularizer of the style of yoga called yin yoga, and patterns his philosophy on the writings and researches of Dr. Hiroshi Motoyama -- a yogi and scientist from Tokyo, Japan. This philosophy integrates the Taoist meridian and acupuncture theories of China with the yogic and tantric theories of India. Paul started his studies of anatomy with Dr. Garry Parker in 1979. He continued his studies at UCLA where he took courses in anatomy and kinesiology. He earned a M.A. from St. John's College, Santa Fe in summer 2000 and an Honorary Ph.D. in 2005 from the California Institute for Human Science for his efforts to clarify the latest theories on fascia and its relevance to the practice of hatha yoga.